The census is the largest peacetime operation conducted by the US government. Article I, Section 2 of the US Constitution mandates that each person be counted every 10 years to properly allocate the number of legislators each state gets in the House of Representatives. A lot has changed since the United States conducted its first census in 1790, when marshals traveled on horseback to administer the survey. Now, that responsibility falls to the US Census Bureau, which uses a range of methods and technologies to complete the count. A prodigious user of GIS, the Census Bureau helped pave the way for where the technology is today. In 1967, while preparing for the 1970 Census, the bureau began developing Dual Independent Map Encoding (DIME) to more efficiently and accurately store its geographic data. DIME converted intersections, streets, and blocks into points, lines, and polygons and allowed users to edit topology (the geometric connections between vector objects). Additionally, for the 1990 Census, the Census Bureau created the Topologically Integrated Geographic Encoding and Referencing (TIGER) database, the first digital map of geographic features—such as roads, rivers, and boundaries—for the United States. 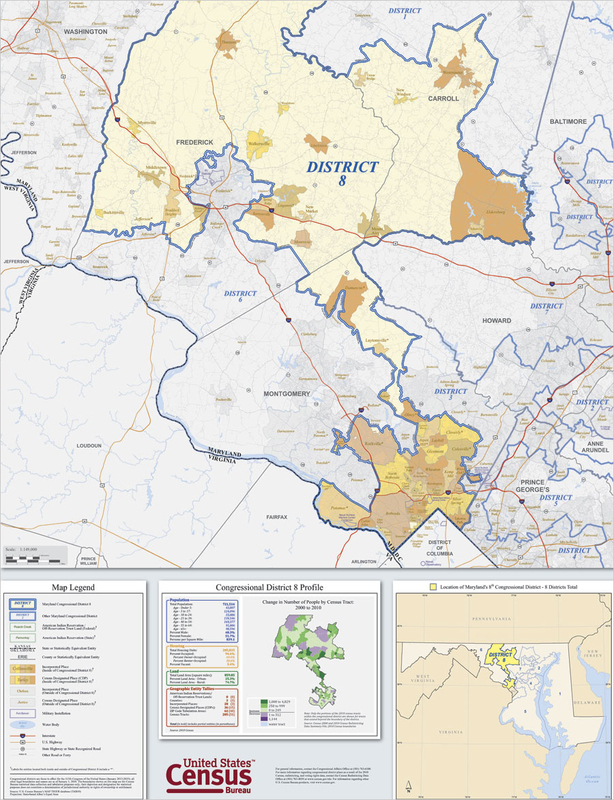 The US Census Bureau's increased use of GIS will help states redistrict their jurisdictions quickly. Since the last census was taken in 2010, the Census Bureau has increased its use of technology in every aspect of the undertaking. For the 2020 Census, GIS is going to be far more intertwined in the process than ever before—from figuring out where to count and encouraging people to submit their forms to enumerating everyone and sharing the results. "We're using the technology in a much greater way than we ever have before," said Tim Trainor, the US Census Bureau's chief geospatial scientist. "There are pockets of [GIS] development going on all over that are eventually feeding into the big picture." 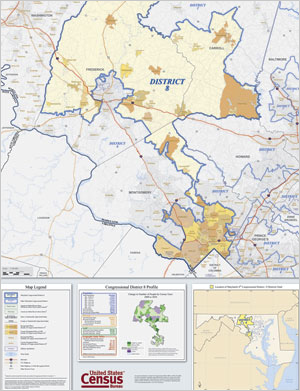 For the 2010 Census, there were more than 500 local census offices and 12 regional census centers to manage them. The bureau hired 140,000 temporary workers to walk every street in the United States and record every unit. The questionnaires were only offered on paper. To find people who didn't respond, the bureau hired an additional 600,000 temporary workers who would go back to a single unit as many as six times to get ahold of nonrespondents. The total cost came to more than $12 billion. "When we looked at the cost of doing the 2020 Census in the same way that we did the 2010 Census, we were going from a little over $12 billion to a little over $17 billion," said Trainor. That just wasn't an option. So the Census Bureau began innovating in four key areas: addressing, response options, the use of administrative records, and infrastructure for field operations. "Those are critical," he said. "And that's where geography plays such a major role [in] the census process." For each decennial census, the goal for the US Census Bureau is to count everyone once and in the correct place. At the most basic level, this depends on having an accurate list of addresses across the United States. Local governments make addresses, so the Census Bureau works with them (and a few states that have good address records) to update its address list. In the past, the Census Bureau checked the accuracy of the list by having employees walk or drive every street in the country—about 6.2 million miles of roads, which the Census Bureau maintains in a database. "For address canvassing, we probably traversed hundreds of millions of miles, though, because people have to get to their assignment [and] they have to drive up and down," said Trainor. "That costs a lot of money." For the 2020 Census, the geography program at the bureau proposed a continual update of the address list instead of doing it all right before the count. This would now be feasible in part because the Geography Division could use the Census Bureau's American Community Survey (which is conducted every year) to get detailed demographic, economic, social, and housing characteristics about the American population. Additionally, over the last 10 years, the Census Bureau has become an increasingly heavy user of imagery. The idea was to take the address list and use a variety of imagery sources to find each housing unit. This was possible because, during the 2010 Census, the canvassers walked up to the front door of every residence on every street and recorded the GPS coordinates. "That was a very, very valuable dataset," said Trainor, since, as he pointed out, many addresses don't change over time. "Using those locations, we're able to link the address to that location." When the Census Bureau began using imagery, staff scanned local government websites to see what imagery they posted and whether or not it met the census's accuracy requirements. The bureau also started using the US Department of Agriculture's National Agriculture Imagery Program (NAIP) imagery. "But as we go down the path of in-office address canvassing, the resolution of one- and two-meter imagery is not as high as what we need, really, to distinguish and discriminate housing unit types," said Trainor. So the Census Bureau connected with the National Geospatial-Intelligence Agency (NGA) to gain access to its imagery as well. The bureau now takes NAIP imagery from 2009 and compares it to more recent NGA imagery to see what, if anything, has changed. And with that, the Census Bureau no longer needs to employ more than 100,000 people to walk the streets of America to confirm addresses. Instead, a couple hundred people use imagery and GIS to canvass them from the bureau's National Processing Center. "Looking at imagery with our address list, they can see where the address is on that space, and they can decide whether they've got the right number within the census block," explained Trainor. "They can just do a quick scan to say, hey, I have 10 [housing units] on my address list, I've got 10 dots on the map, and there are 10 units there. That looks pretty stable. Let's move onto the next block." If an in-office canvasser comes across an image where it looks like there might be construction happening or there appears to be more or fewer housing units in the block than previously recorded, he or she puts that segment aside to revisit later—perhaps with some better imagery from a local government or, down the road, by sending someone out into the field to see what has changed. In just six months, the Census Bureau analyzed more than 3.5 million blocks out of the 11 million it has to tackle. What's more, the address canvassing began three years before it would have in previous censuses. "We're estimating a savings of about $900 million just in that one innovation alone," said Trainor. Another modernization for the 2020 Census is that the Census Bureau will offer people three different ways to fill out the census: by paper, by phone, and via the Internet. Although it may sound outdated that people couldn't fill out the 2010 Census online, the digital transformation has really only recently gotten into full swing with the increased availability of mobile devices and a profusion of social media. For the 2010 Census, "we determined through studies we'd conducted that the people who would use the Internet would still respond to the census using a paper questionnaire," explained Trainor. "So we didn't really see a benefit in the response rate." At the time, it also would have been rather expensive to offer other options besides paper. This time around, the Census Bureau will still send the census through the mail, as it did before, and each form will again have a unique code that identifies that particular housing unit. Some people may prefer to fill out the paper form and mail it back. Others may have questions about the census and call the questionnaire assistance center, where, in addition to providing support and answering people's inquiries, operators can actually fill out residents' census forms over the phone. Still other respondents may decide to fill out the census online. To do this, residents can either input their form's code to identify their housing unit or, alternatively, enter their address. When a resident chooses the latter route, the system taps into the Census Bureau's list of 150 million US addresses. If the address matches what is on the list, the resident can fill out the questionnaire. But if the person types in Main Street and the Census Bureau only has a Maine Street in that town, the user will receive a drop-down list of addresses to choose from. If the resident decides that none of them are correct, a map will appear so he or she can identify the housing unit by pointing and clicking. Then, the person fills out the form and the Census Bureau has to validate the address. With this, the Census Bureau no longer has to rely on hoards of employees to pore over millions of paper forms, keying in the data that could not be scanned. Instead, GIS automatically performs quality assurance checks on the geographic data submitted online, matching form codes and addresses to the geocoded housing units the bureau has on record. But what about when people have multiple homes? If the Census Bureau wants to count everyone once, then issues like this are challenging. "Some people have housing that they don't normally live at all the time, but we don't know that," explained Trainor. "I've got an address list, and it's got [someone's] primary home and it's got their secondary home. I don't know where they live most of the year. So we're going to send a form to every one of those units because they're on our address list and they're valid addresses." The US Postal Service, however, has a good idea of when people have more than one home because residents often stop their mail when they're not going to be at one location. For the 2020 Census, the bureau is looking to use third-party administrative records like these to fill in the gaps. So if a housing unit in Boca Raton, Florida, is unresponsive to the census, the Census Bureau can match postal service records with the census address list to see if that unit is designated vacant during the census. If so, there's no need to send someone to that house over and over to solicit the resident to fill out the census. "That savings is going to be substantial," said Trainor. That said, Trainor thinks the Census Bureau will save the most money by infusing its field operations with more GIS and mobile technology. Although the census has a 65–67 percent response rate, which is exceptionally high, the Census Bureau still has to get the rest. And nonrespondents live across the United States, so this ends up being a huge field operation that has to be completed in a short amount of time. In the past, this has required hiring hundreds of thousands of temporary staff to go door-to-door to find the people who didn't fill out the census and convince them to do so. All these employees had supervisors as well to introduce them to their assignments and oversee each portion of the larger operation. "We used mobile technology in 2010, but it was basically to ensure that we had complete coverage and to give folks an idea of where they were," said Trainor. "There was no navigation capability." For the 2020 Census, however, the Census Bureau is looking to expand its use of mobile technology and incorporate navigation and workload management into it. "When we hire [these temporary staff members], we geocode them to their location…to give them assignments close to where they live so we don't have people traveling [farther] than they need to," said Trainor. "It's also an opportunity for us to manage whether or not we have enough people in a given area to do the work, which has always been one of our greatest concerns." The Census Bureau also wants to use mobile technology to provide field employees with short, portable training segments. "We're very good at making manuals, and we've made hundreds of pages of training manuals that some people read and others don't," said Trainor. "But we're moving away from that and trying to make it as easy as possible for people to understand…how to do their jobs"—ideally allowing them to refer back to their training materials while they're out in the field by using their mobile devices. This will let the Census Bureau significantly reduce its field infrastructure and supervisory setup. "This time around, we'll have six regional census centers and approximately 300 local census offices," estimated Trainor. That's a 50 percent cutback in regional management and a 40 percent reduction in on-the-ground labor. The US Census Bureau is hoping that its increased use of GIS and other technologies will lead to a safe and easy 2020 Census and bring expenses down to 2010 levels. "We're estimating we'll be in the neighborhood of a $5 billion savings," said Trainor. Not only that, but by digitizing many operations and using GIS more pervasively throughout the census cycle, the Census Bureau anticipates a more efficient, seamless enumeration on census day, April 1, 2020. States across the country will certainly appreciate this, since they only have a few months after the first part of the census data is released in early 2021 to redistrict their jurisdictions for elections later that year.